This subject of this week’s newsletter is the increasingly inane demands for Barack Obama to display more emotion over the BP oil spill. As usual, I wrote it Wednesday night, and by now it seems almost quaint. I think I’ve seen at least a dozen columns and blog posts saying the same thing since then. The tyranny of lead times doth make hacks of us all sometimes. Starting next week, however, we’re going to cut that lead time down and publish these posts early Friday morning, the same time the newsletter is mailed out. That’s only a 24-hour lead time, which should help keep these things a wee bit fresher. Washington could hardly have been clearer: only children demand simple answers and immediate reactions to complex situations. So how about if we act like adults instead? 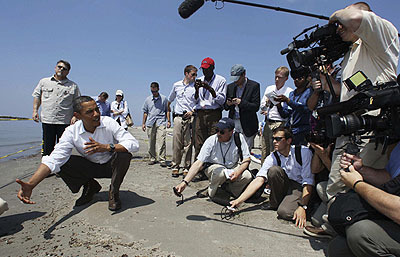 But if the events of the past few weeks in the Gulf of Mexico are any indication, the press corps still isn’t listening. There are plenty of things about the government’s response to the gulf oil spill that are worth questioning. Why is the Minerals Management Service still in such sorry shape? Why was BP allowed to misstate the extent of the spill for so long? Are chemical dispersants just making the problem worse? Why is the press still being given the runaround more often than not? But one thing isn’t in question: when it comes to actually capping the broken pipe, BP and the rest of the oil industry are doing everything they can. What’s more, they’re the ones with all the expertise and President Obama can’t change that. Yelling at BP or putting on a mask of faux outrage for the benefit of the cameras won’t change that. But now this is threatening to go beyond just the world of overwrought pundits. On Thursday the New York Times reported that Obama was considering cancelling a long-planned 10-day trip to Asia and Australia. There was no suggestion that this was because Obama could actually stop the spill any faster by being in Washington, just that it might look bad. “This has hijacked his entire legislative agenda,” said Douglas Brinkley, a historian at Rice University. Later that day the White House confirmed that the Asia trip was indeed off. Obama is famous for taking the long view of things. If you do the actual mechanics of governing properly, he believes, the daily media storms will all blow over eventually. Maybe he’s right. At the moment, though, betting on the American media to grow up is looking like long odds indeed.